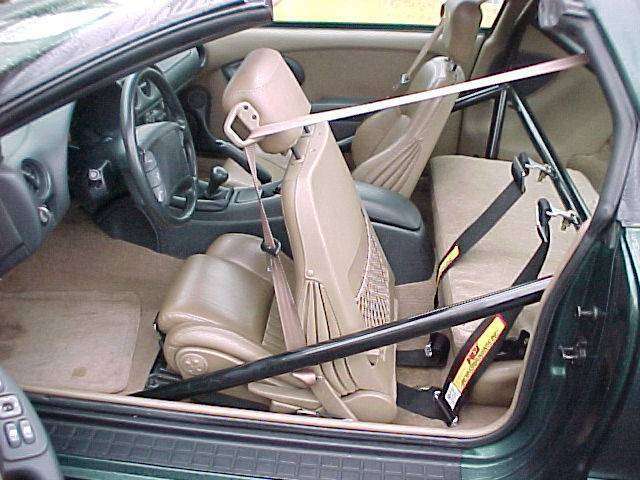 Due to faster and faster trap speeds, the desire to avoid hassles from NHRA drag racing and ECTA standing-mile tech inspectors as well as a general concern for safety on the road racing jaunts, Randy Brown decided to install a 6-point rollbar in his rocket 1994 Pontiac Formula. 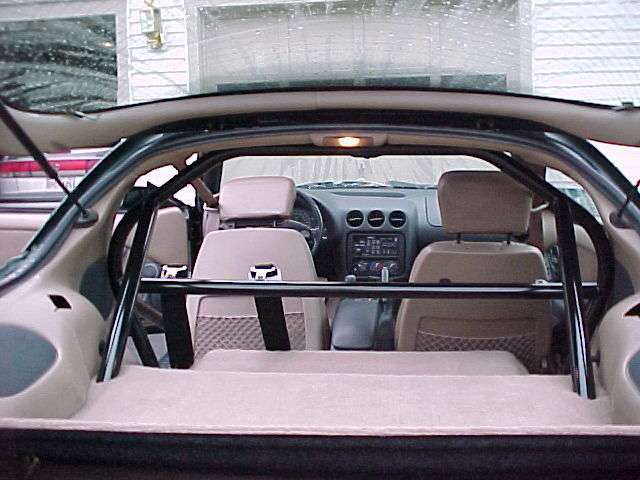 Randy and jC spent a weekend with weldmaster Jon Groves of Groves Automotive/Wild Willie's Racing Engines to design, build and install a custom-fit rollbar that would tie into the major structural points and yet be as un-obtrusive as possible. The following shots are pretty self-explanatory... they are a good reference to look back on during and after a project. 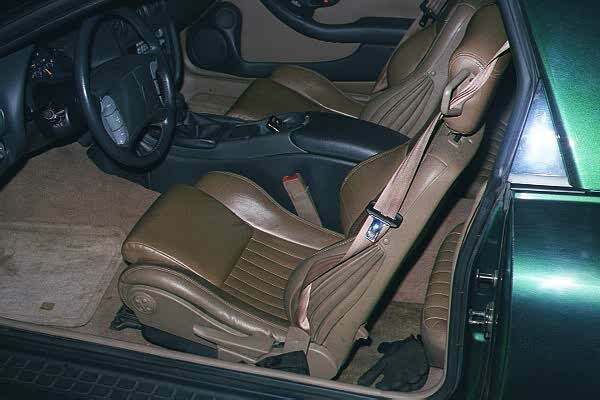 An hour was spent removing the interior, seatbelts, seats, console, etc. Time must also be taken to ensure fuel lines won't get burnt. 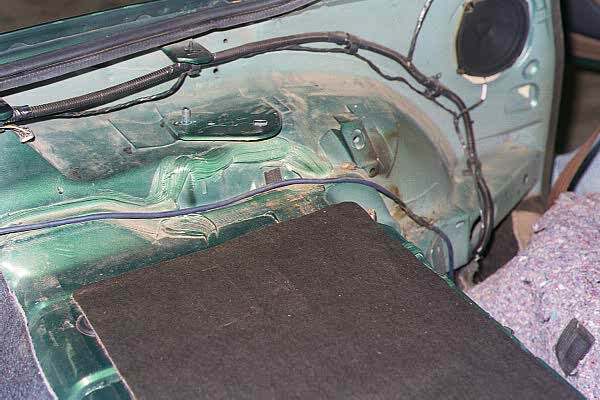 For Randy's car, we left the fuel lines in place, but for Ken's and future installs it's a better idea to disconnect the lines at the driver floorboard area since the front mount point for the driver door bar is right there. 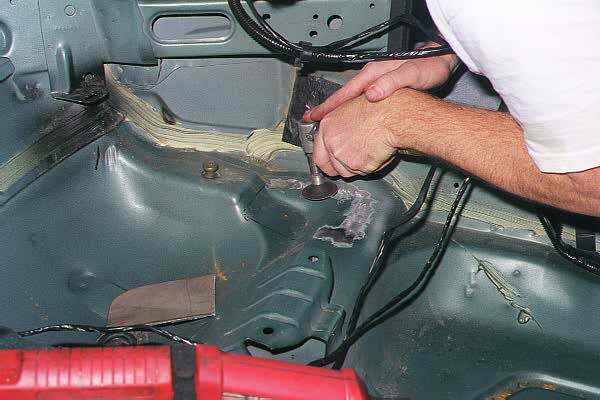 Here we ready the mount points and start fabricating the rollbar. 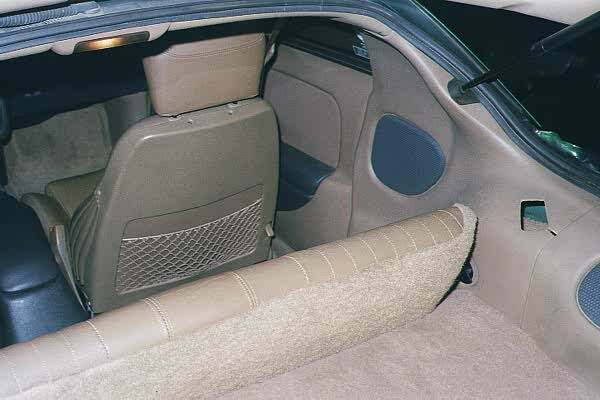 For mount points, we were constrained by Randy's desire to be able to keep the rear seat cushions installed and not have to modify any factory interior panels. 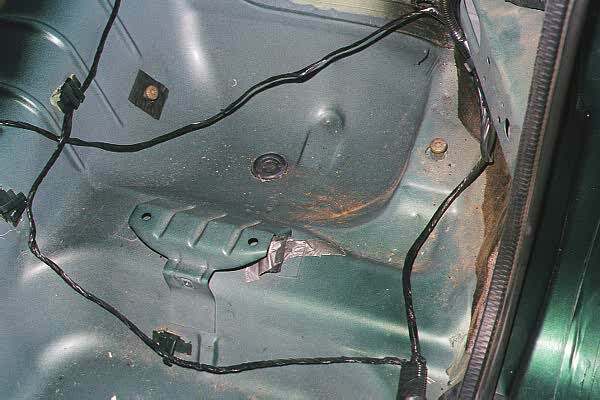 We also wanted to tie into significant structural areas of the chassis, so we tied into the upper spring/ shock pads in the rear, the front part of the rear control arm/ subframe connector area for the main hoop, and into the front part of the subframe connectors for the front of the door bars. 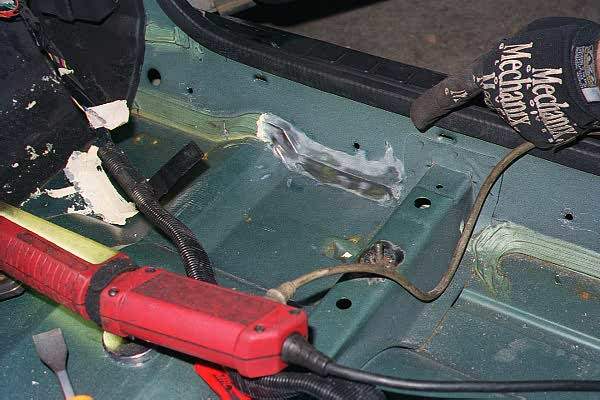 The spots where the mount plates are to be welded are ground free of paint down to the bare metal, and any nearby body seam sealer "googoo" has to be tediously scraped away. 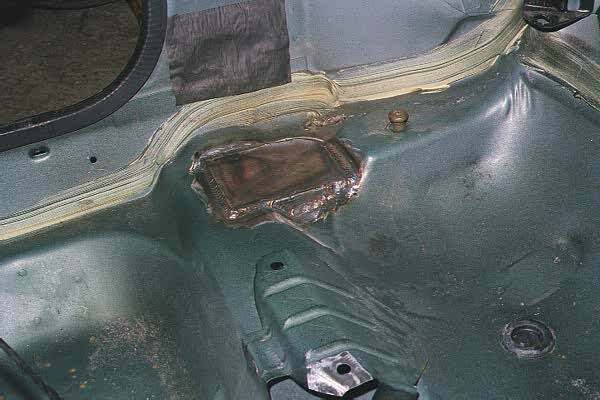 The passenger front mount plate welded and seat stud welded - also a good idea since several of Randy's had separated. 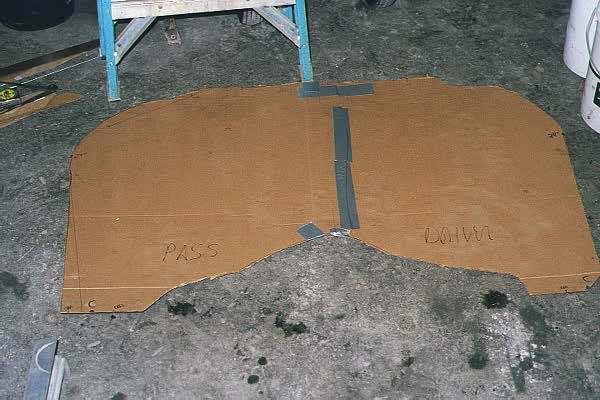 Also note that pass side floor has to be notched to clear the door bar. Driver side rear bar mount point ready to be welded. 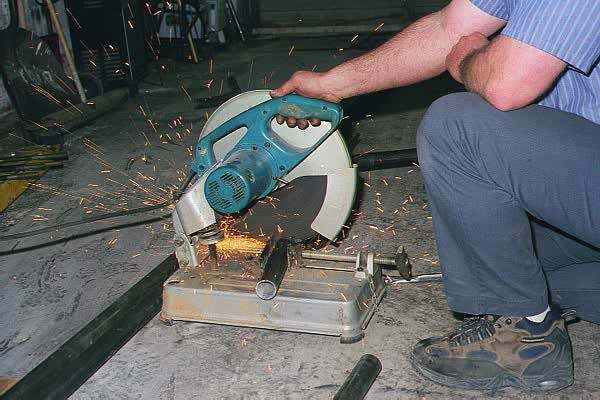 Once a rough measurement is made, a section of tubing is cut to length. 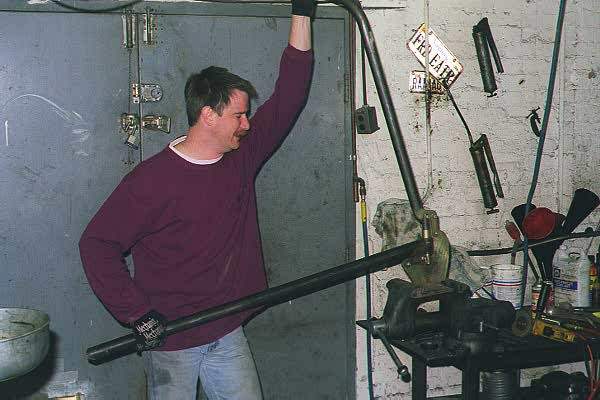 A tubing notcher is used to nibble bites out of the tubing for complex angles against other tubes. 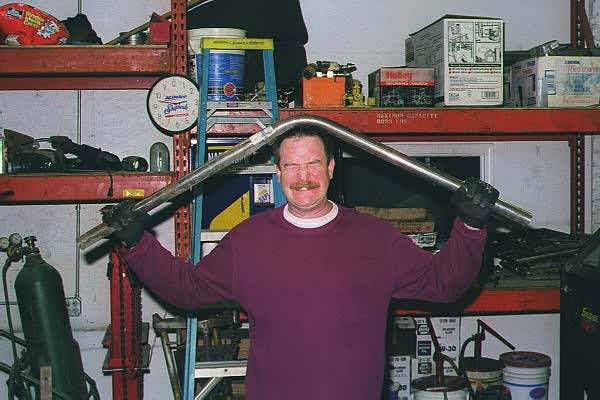 Randy bends a section of tubing. Since his head started hurting, most bends were done with a trick hydraulic bender. Here the main hoop has 2 of the 6 bends completed. Once the main hoop is bent to fit, it's ready to be installed. 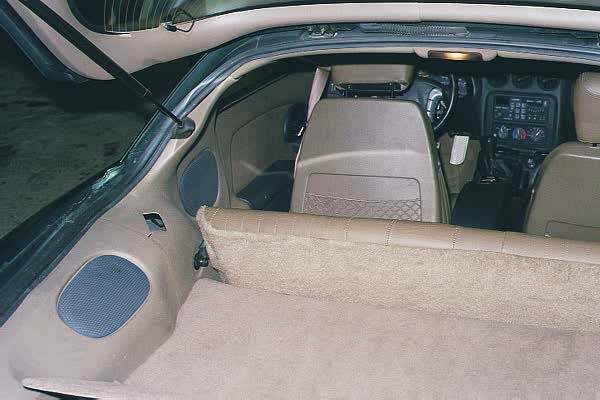 Since one of the biggest goals for the installation was to have the main hoop hug the sides and roof of the car, we really had to spend some time on it. 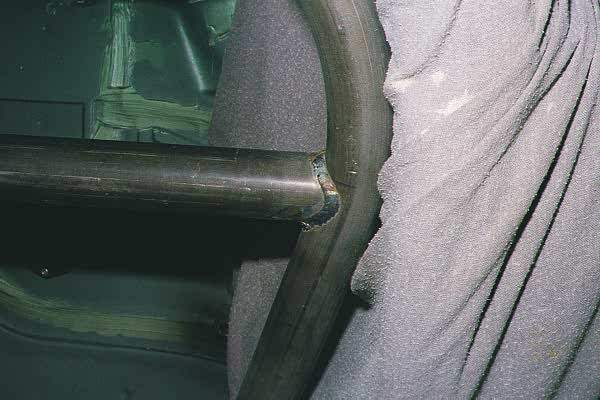 We also found that we couldn't leave the 1/4 trim panels out while welding the main hoop and other bars because they couldn't be reinstalled! 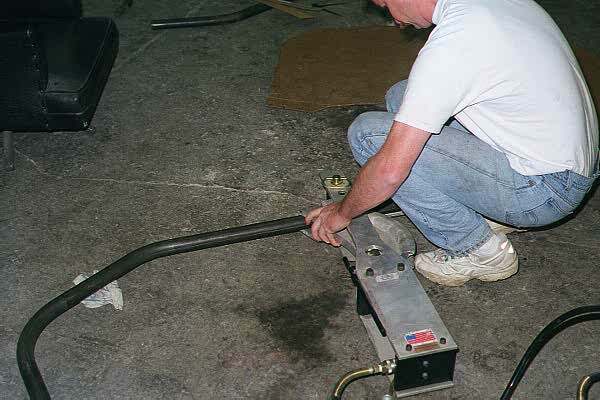 We used wet towels and compressed air to keep things cool when we had to weld close to the panels. 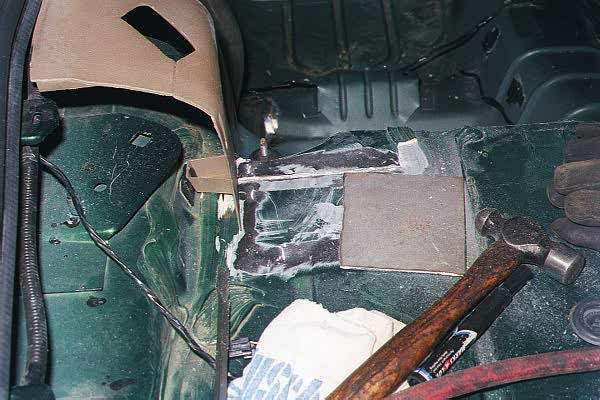 It's also important to note that the door bars are very critical to get in the right spot. 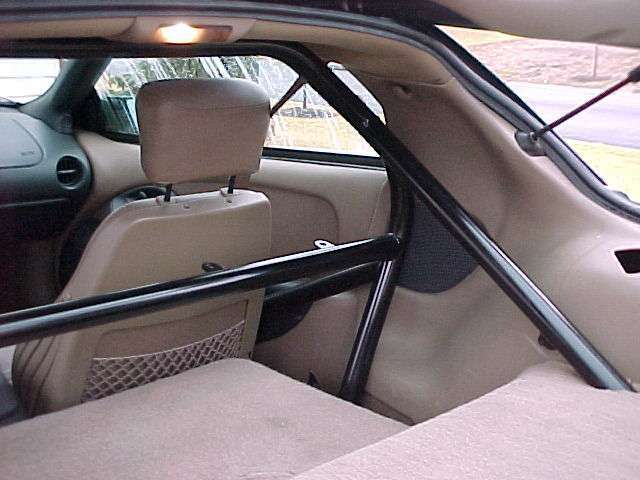 Since we used NHRA legal 1 3/4" mild steel, there's only about 1/8-1/4" of spare room between the seat and door arm rest once the bar is in place. Since everything ties into it, the main hoop gets welded in first. 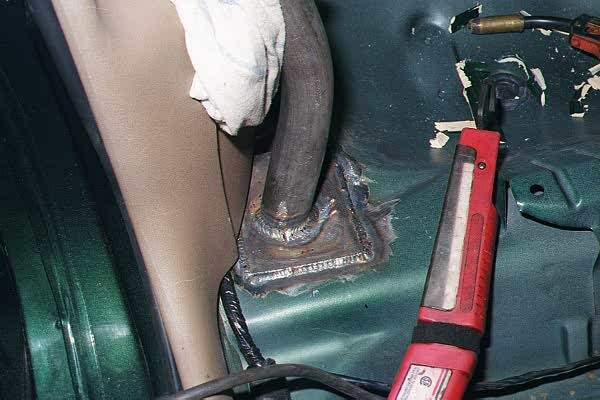 The rear bars get trimmed and notched to fit, then welded. 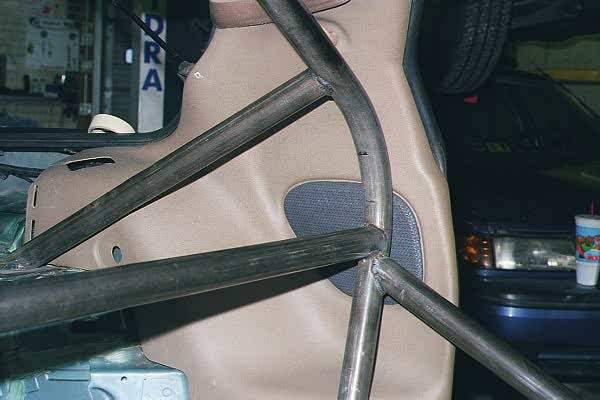 The seat-back bar gets fit and welded in standard Groves artistic fashion. 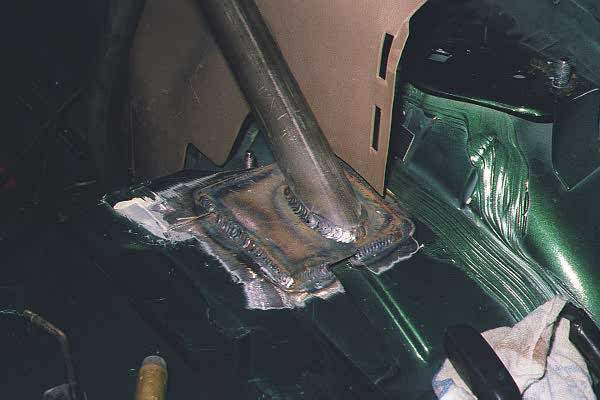 The last two - the door bars are carefully fitted and welded. 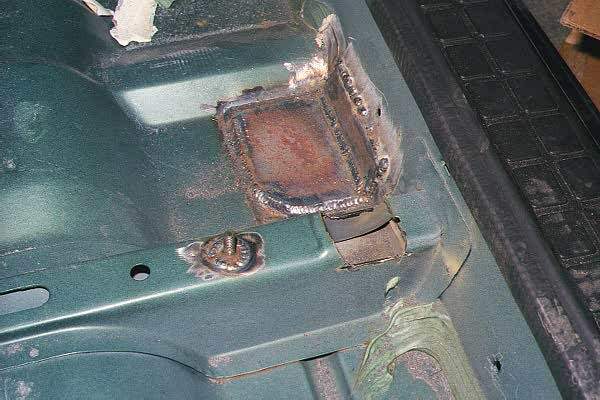 After all the bars were in, Jon finished up by welding the harness tabs onto the seat-back bar. 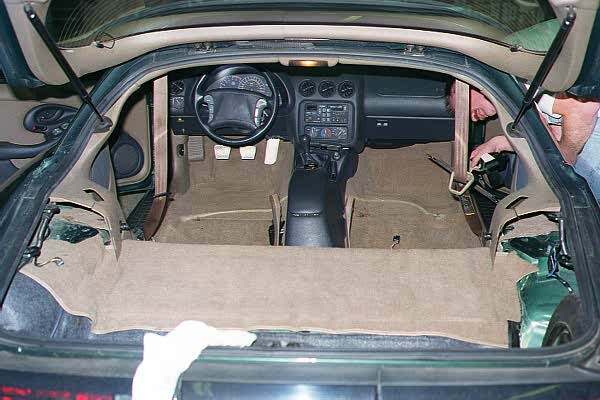 For this we had Randy sit in his normal racing position with the seat installed. 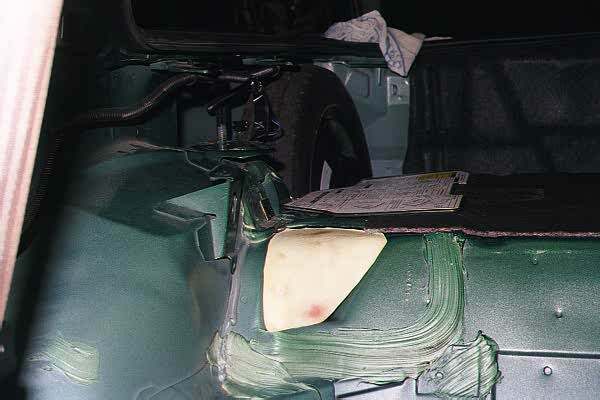 Back home, Randy toiled over the masking, taping and painting of the rollbar for another 20 hours! Thanks to Wayne Edelen for the finished product pics.